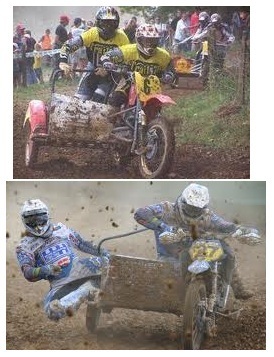 motorcycle sidecars for dirt tracks - Why the sidecar? And whats the history? Dirt bikes and sidecars – an un-usual combination. Motorcycle Sidecars for Dirt Tracks - The history of sidecar design. Motorcycle sidecars were a common US racing event in the 1920s, although most likely no one realized the influence that the sport of motorcycle sidecars for dirt tracks had, until decades later. The crowds came out to watch the excitement of this strenuous racing event. The motorcycle, permanently tilted, had a sidecar with rigid mounting. The Flexible Company of Loudonville, Ohio, later known as Flxible, produced a flexible chassis mount. It was great at keeping the sidecar and motorcycle upright in the straights, but all three wheels tilted in the turns. The rider could not achieve enough tilt for the turn. Using Yankee ingenuity, he would jam his foot against a footrest. That gave maximum tilt, causing the rig to slide around the turn. In an attempt to compensate for the problems, Flxible connected the motorcycle and sidecar with a parallelogram linkage. The upper bar, shaped in a broad U shape, padded through the lower bar. Trying to adjust with flexibility, a set kingpin angle on the sidecar wheel allowed it to turn slightly in the right direction when it tilted. Fatalities and injuries led to a ban on motorcycle sidecars for dirt track racing in the United States. Anything to do with engines and racing is destined to continue, and the future sport of sidecar racing was waiting for its time. The sport of motorcycle sidecars for dirt tracks was revived with additional restrictions in the 1930s. The sidecar passenger, called the monkey, helped the driver gain the best traction in corners. The passenger, in continual motion, did all he could to be sure the sidecar did not flip over, including leaning out from the side of the car as much as possible. The respite was very brief. Few riders wanted to compete as drivers or passengers and there were not many fans. Sidecar racing, also known as SidecarCross, reformed in the US in the 1950s. It is extremely popular in Europe, with fierce competition from the drivers and passengers of various localities and countries. Australia and New Zealand also participate in the sport, but not to the level of Europe. 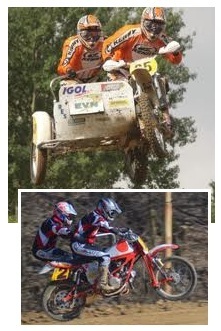 The top competition level is the SidecarCross World Championship, held in Europe. Motorcycle sidecars for dirt tracks consist of purpose built frames. The bike resembles a regular motocross bike except there is a standing platform attached to one of the sides of the bike. The platform and passenger usually are on the side used for driving in that particular country. A handlebar about waist-high is convenient for the passenger to hold. The passenger is a counterweight to balance the bike, particularly when it comes to jumps and corners. It requires a lot of guts, energy and skill. Two stroke engines are most common, such as those from Germany's Zabel and Austria's MTH. Four strokes have entered the market, with Austria's KTM the most popular. Companies like BSU and Woodenleg build the frames. The market and businesses receive a lot of business thanks to the motorcycle sidecars for dirt tracks. One of the main reasons for success is that teamwork makes everything about motorcycle sidecars for dirt tracks work the right way. Some drivers, such as Daniel Willemsen, achieved championships even when the team changed. Willemsen has won six world championship titles. His passengers changed four times. Other teams inspired awe with their performance over the years. Kristers Sergis was the driver and Artis Rasmanis the passenger, winning the World Championship 5 times between 1997 and 2002. It is one of the most successful partnerships in SidecarCross world championship history. Rasmanis retired at age 32 just after the team of Sergis and Rasmanis won their fifth title. He started racing quad bikes and finished twelfth in the 2007 FIM European championship. Try mx sidecar racing for yourself, but there will be no sidecar drink holder for you! These are purpose built machines – take a look at the dirtbike sidecar pics online. If you buy a used dirt bike or a used sidecar do all the necessary checks on the bodywork and sidecar tires – it’s easy to buy a hunk of junk. There are numerous brands even custom made ones. You can encounter an entire used rig on ebay and biketrader every now and again, and the cost is surprisingly cheap. If you are wanting to try your hand at sidecarcross, it’s pretty affordable – you only need to find a brave buddy to help you out.